Betfair is back on TV and they're spoiling their new casino customers who can now receive a free £5 risk free bet on Exchange Games. 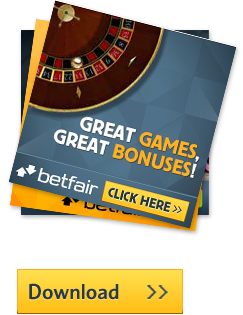 Betfair Exchange Games is an integrated part of the Betfair website and currently features seven different games with new ones being introduced from time to time. Exchange Games like Poker and Baccarat tend to attract many pro traders as odds usually swing very fast between the hands that are favorites. Besides more traditional casino games like Blackjack, Poker, Omaha and Baccarat, other pretty unique games are available at Betfair Exchange Games. In the HiLo game, for instance, the player will back or lay the computer to correctly predict the next card in a sequence: will the next card be higher or lower than the previous one? Betfair Exchange Games also hosts a virtual horse racing game called Card Derby Racing where "virtual horses" race along the track as cards are being drawn to determine their progress in each round. Betfair has made an Educational video to explain the concept to new customers and are offering a new £5 risk free bet every week they play so long as they opt in. Visit the Exchange Games section and opt in for this risk free bet. Then all you need to do is place a £5 back bet at odds of 2.0 or more. If you win you can transfer your winnings back into your main betfair balance. If you lose then Betfair will credit the £5 bet back into your account within 72 hours. Click here to open a new account with Betfair and take advantage of this risk free bet. Winner Casino in-depth review: information, bonuses and ratings. 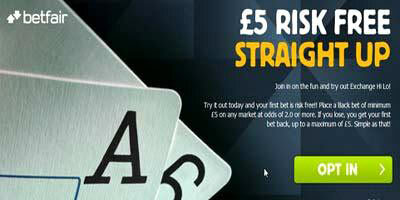 "Betfair Exchange Games: 5 pound risk-free bet"